During a concert at my home I casually mentioned anger at my former husband for leaving our relationship of eleven years. The male musicians exclaimed in unison and perfect harmony, “I’m angry at him, too!” It was obvious that they didn’t even know David and the room broke out into laughter. The spontaneity of the solidarity surprised and comforted me. Maybe I shouldn’t have been surprised. These musicians who had volunteered their time for a private concert on my behalf have known their share of heart breaks. The energy in the room was electric with empathy and love. The moment made me reflect upon that relationship, the relationship which would be my last partnership, with my last companion for this lifetime. It wasn’t that I was so sad to see him go, but more that I was so sad to let our life go. It was in that relationship where I finally was able to realize some of the adventures I had always sought in previous relationships. David helped me to hold the container for a life full of adventures, like camping, horseback riding, long road trips and things I had never thought I would be able to experience. Now that I live alone in the wilderness, knowing many other powerful wilderness women, I wonder where that insecurity could possibly have come from. After all, I had ridden my own motorcycle to Key West, jumped off mountains in California on a zip line and learned to jump horses in my 50s. Granted, David was a warrior in the outdoors. After all, he had been a geophysicist, a public school teacher and was able to operate any heavy machinery needed. He taught me how to hook up, load a horse and pull a horse trailer by myself. I had no reluctance to do so, in fact, I was excited to add this to my repertoire. In our life together, this skill was required. David could fix anything. 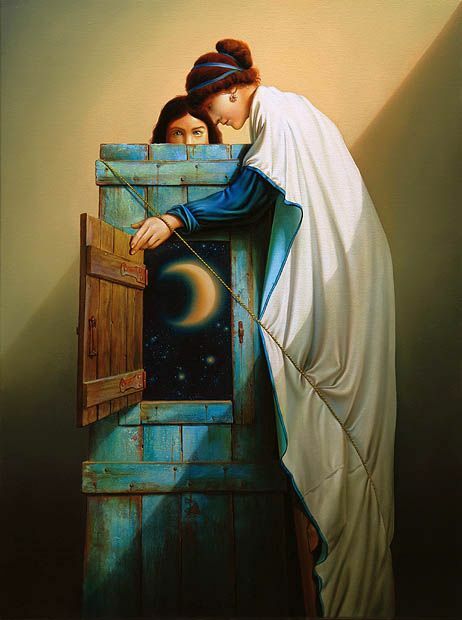 And when we connected, many of my things were broken and needed to be fixed; and fix them he did. David appreciated being helpful. What was strong and unbroken, however, was my heart and spirit having just spent three years recovering from a relationship so devastating that it forced me to reflect on the quality of all previous relationships. To do so, I had chosen to extricate myself from romantic relationships in order to focus on the most important relationship, the relationship to Self. Right from the beginning of our relationship, I was upfront with David about the concerns around my physical body. Along with many of my material items needing to be fixed, I needed a breast biopsy and abdominal surgery for fibroid tumors. Ever since being a young child, I tended to somaticize emotional issues. This gave me much material to address psychologically and many physical issues to deal with medically. David really tried to be helpful around my physical vulnerabilities, but he was much more capable around the mechanical items. His caring was never an issue, his ability to express that caring was considerably limited. In my opinion, and realize that I am not the most objective reporter, when partners in his life were physically and emotionally vulnerable, David left. I’m not sure whether my children so vehemently disliked my former husband, because they perceived that he left me when I most needed him, or because he never really was able to connect with them on an emotional level. Perhaps both are true. In the spirit of not tossing the baby out with the bath water, I would like to honestly visit what this relationship was to me. I met David at the Gurdgieff school during the early 90s when I was entering this work. We were with our respective spouses and I cannot say there was any connection between us beyond the surface level. Fast forward five or six years and two divorces, when he brought an at risk student to the mental health clinic where I was employed. Still, no connection beyond colleagues with the intention to save an adolescent from imploding. A few years later we connected at a play in our neighboring community. At this point he asked me to dinner and a movie. We were slow to connect, but there was something gentle and deep about him. As I previously mentioned, I had just spent three years consciously turning inward for the first time in my life, forging a relationship with my deepest Self, something I had resisted until, as Anaïs Nin wrote, “…the risk to remain tight in a bud was more painful than the risk it took to blossom.” I wasn’t sure about this new person, but I was encouraged vehemently by others whom I trusted, so I continued to explore this connection. I never really knew myself until I was nearly fifty, so how could I know what was deeply fulfilling in a significant relationship? I would suspect that most people know themselves better than I did. I was a slow learner, after all, my first husband was a Republican who told me the Holocaust never happened. How well could I really have known myself then? My second husband and I shared a deep love and grew a lot together, but he wasn’t wild about being outdoors. He would play racquetball, occasionally, serving with his left hand, which was accommodating, but his idea of camping was staying in the Holiday Inn. With both of these men I had my children for which I am tremendously grateful. And I had a beautiful stepdaughter who initiated me into the teenage years. They all enriched my life tremendously. When I connected with him, David lived on a peninsula in a pristine Louisiana cypress swamp draped with Spanish moss in a house he built with no running water. Along with our outdoors activities we soon realized we both shared a deep love for horses. We began going on weekend field trips to visit different farms. We began riding and eventually purchased a horse for each of us. When the boarding expense became too great, we purchased a small horse farm in the neighboring village. 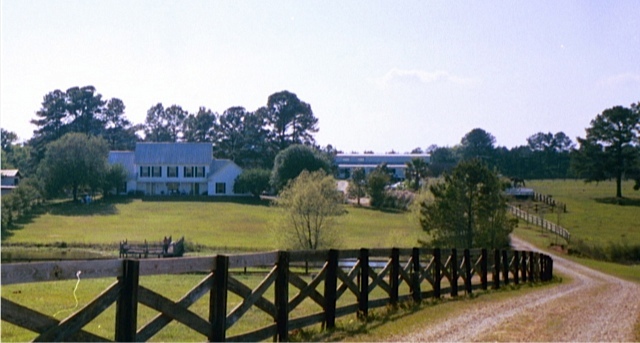 When the commute became too difficult, for example, when a horse’s life was in danger and required instant attention from us and a veterinarian, we decided to move to a larger farm where we could live on the premises. We began boarding other people’s horses and developed a horse community. At this point in my life, surrounded by many animals and like minded people, riding and showing, practicing psychotherapy, driving weekly to sing in my interracial gospel choir in New Orleans, I was living my dream. Concurrently, I was being chased by an unknown specter, a progressive life-threatening degenerative illness. The weakness was progressing steadily as I tried to enjoy every minute I was afforded. In all fairness, this was not a minor vulnerability. David had to retrieve me off the floor many times and fix many fences that I drove the tractor into when losing coordination. It was not a pretty sight and certainly not for the faint of heart. David was extremely strong, but this strength manifested on a physical level and what was being stretched was on the emotional level. The majority of marriages with a degenerative, life-threatening illness end in divorce, especially if the husband is the caregiver. Regardless of why this is, it just is. In our situation, we waited too long to ask for help. We could not foresee the level of disability I would incur, not in our wildest dreams. And I was so focused on healing physically, that the alternative was not even an option for either of us. 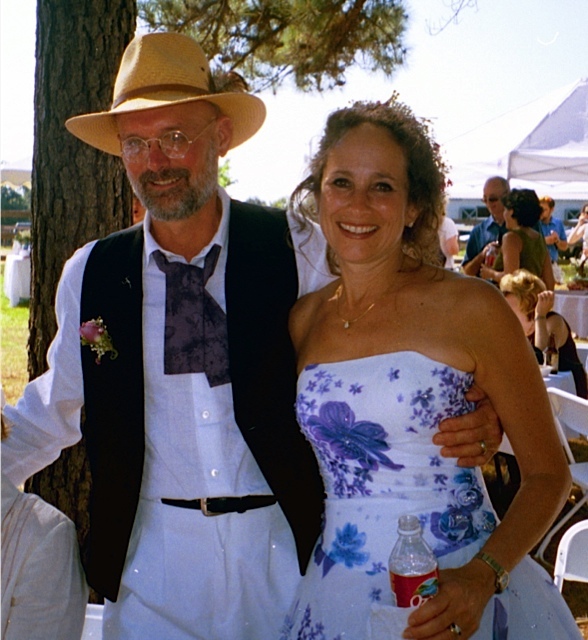 When we were married in 2004, I was already limping. My default feeling has always tended to be fear versus anger. I was terrified. I desperately wanted David to fix this situation and David thought that if he loved me enough, I would heal physically. From this older and wiser vantage point, it is clear that I needed to do this curriculum on my own. I do not believe a curricula this demanding could at all be arbitrary. I have come to feel in my cells that this is for my highest evolution and for the evolution of those around me. So, to set the record straight, we all have done the best we could. This invisible taskmaster has demanded it all from each one of us, including and especially my children who were unaware of my unspeakable demand during that accelerated time and forgiveness from that time is my prayer. I had always wanted to paint, but completing my masters degree, birthing my children and establishing my career had taken central focus. When my children were in middle school, I enrolled in a painting class in Abita Springs. My instructor, Alexander, was a well-known Russian painter. He had an air of being accomplished, whatever that means. He believed that painting on other people’s paintings was a desirable, effective method of teaching. I, on the other hand, had a difference of opinion. I felt violated when he painted on my painting. Evidentially, this is a common dilemma in art school. When I complained, he told me people liked it. When you incarnate to work on a particular issue, your life becomes a microcosm that projects and amplifies this very issue, everywhere. It took until my third painting to realize that I could scrape his paint off my painting. I remember his surprise when he noticed I had done that. Obviously, people actually liked him painting on their work. In me, however, this elicited rage! Finding my own voice and not giving my power over to the authority had been a central challenge my whole life. When he noticed I had scraped his paint off, the words just simply came to me, “I know you can do it, I just don’t know that I can do it.” That was it. Handled. A lifelong issue can be handled in a moment when a critical mass has been reached and the student is ready. I thought I signed up for oil painting! Isn’t that the way? After that, he knew where I stood, I had marked my territory. 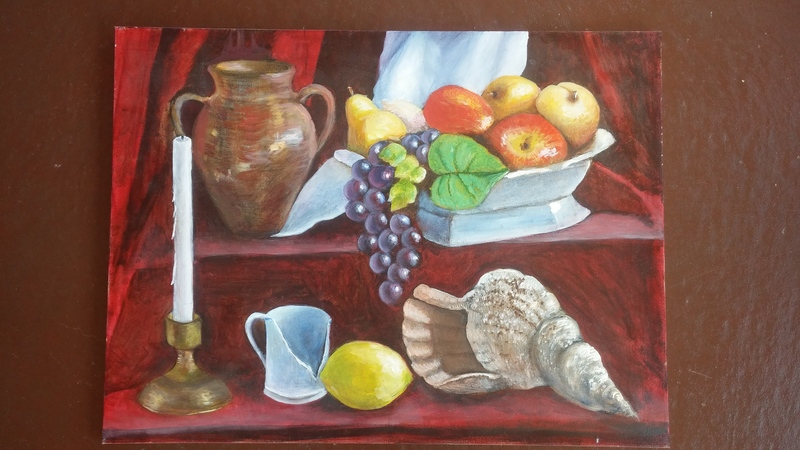 My first oil painting in my life was of the cobalt bottle. 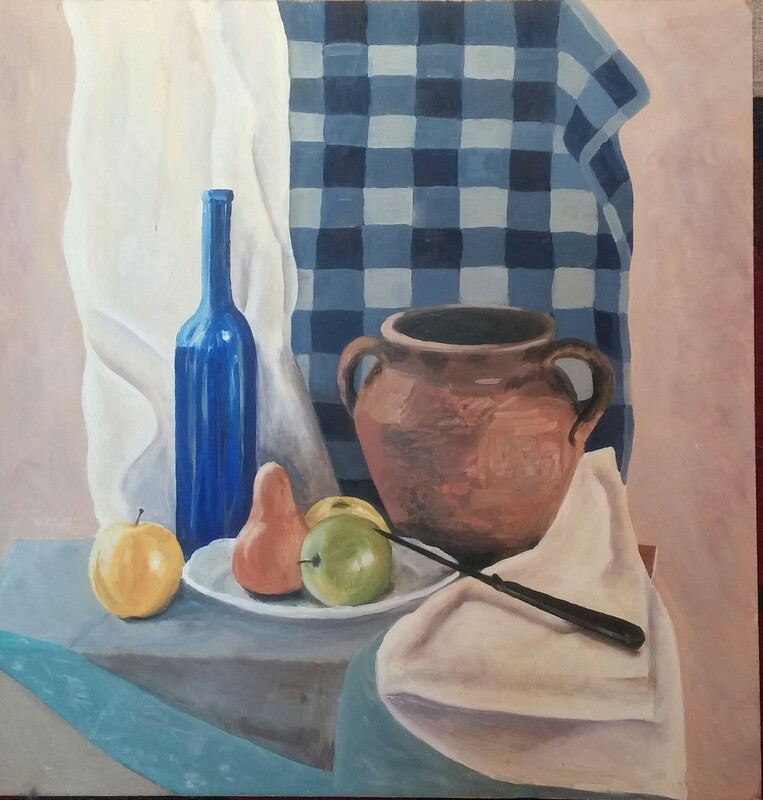 I remember the awkwardness of painting the knife, be unending squares of tablecloth. I also remember when Alexander painted on my pear; I felt paralyzed. My feeble markings looked in adequate next to his. Isn’t this how giving one’s power away works? After all, this was my first painting ever. It would take two more paintings for me to find my voice. 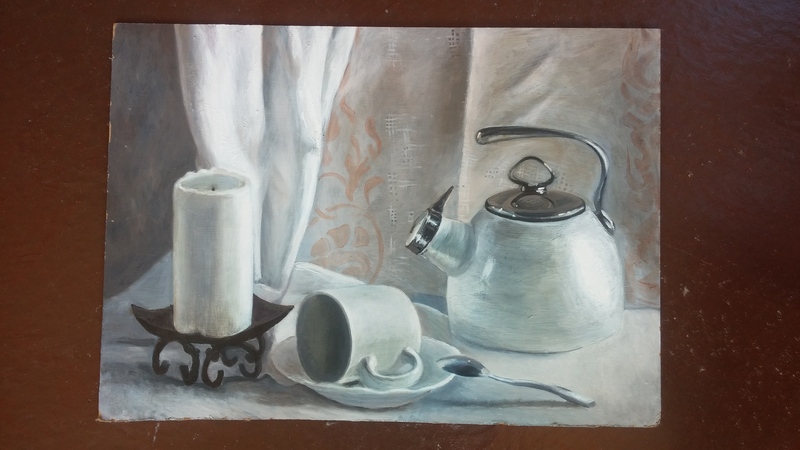 Our next still life was a study in virtually black-and-white. What an interesting challenge. I had barely noticed the peach colored design on the background cloth, that is, until Alexander painted peach on my black-and-white. I had not even noticed the third color. That is, until I did. Alexander knew how to create a challenge. Our last painting had a red background. I thought it was loud and garish. Nevertheless, I was beginning to trust the wisdom in Alexander’s choices for the development of my newfound craft. The varying textures, the metal candlesticks and different fruits ended up being brilliant choices to go beyond my comfort zone. If you think my paintings are pretty good, everybody’s paintings in this class were as good or better than mine. I suspect that this class was a good fit. 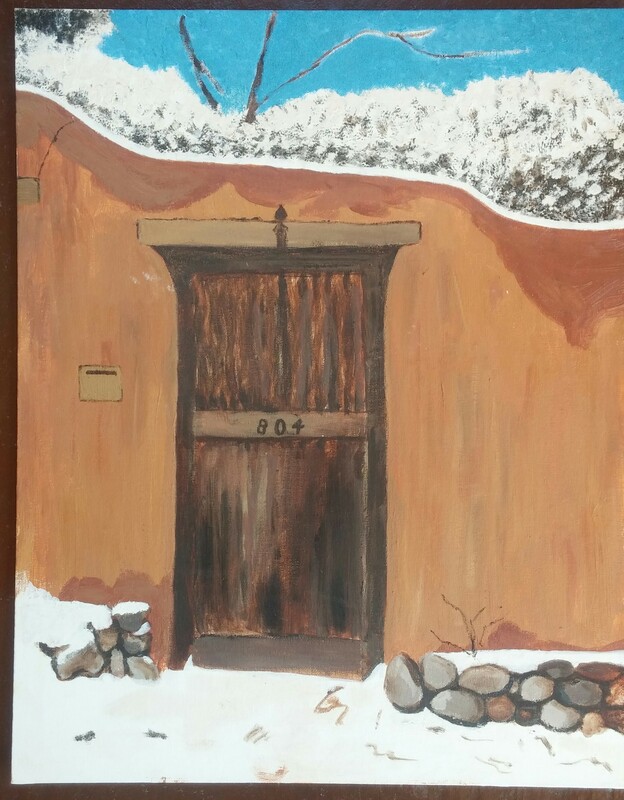 I painted the doorway painting, but I was losing my patience along with my coordination. Nevertheless, letting go is not easy for me. 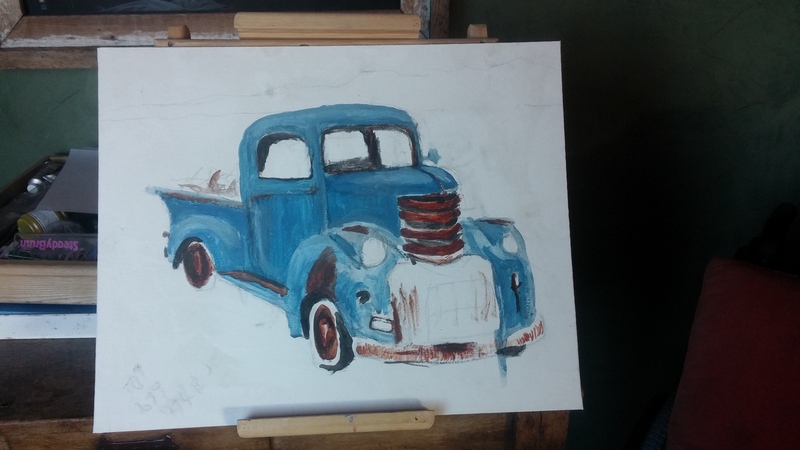 I began my final painting, the blue truck, which remains unfinished today. So there you have it: my complete gallery. Contemplating end-of-life decisions, issues regarding my legacy and considering my loved ones, I have been going through all of my material items, weighing their importance, feeling much grief and letting it go to the best of my ability. 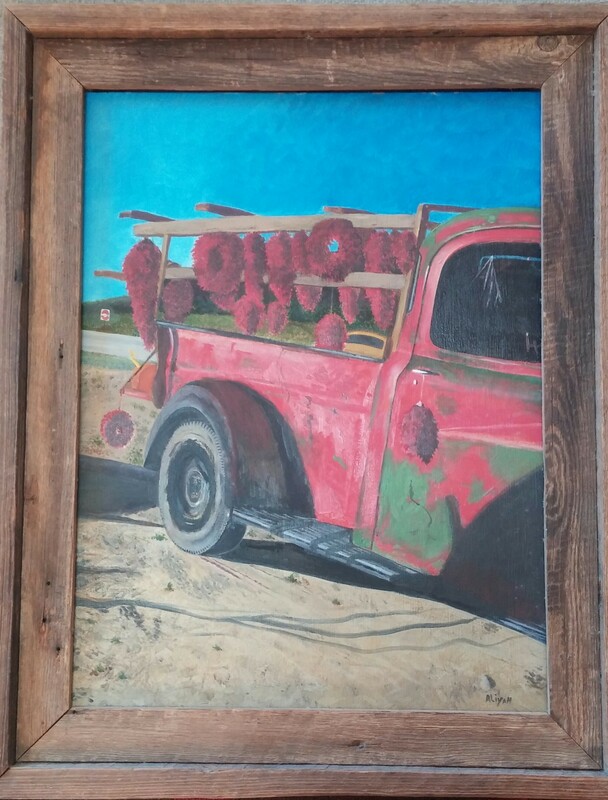 I have decided to leave the red truck, my only completed painting, and to River, my grandson. Hope he will receive it with half the joy that went into it. The blue truck is to be for Luc. My daughter Casey has agreed to finish it for me. We have very different style, but she is a true artist. This became clear when she was only three years old, in her first art class, when she built a Madonna out of clay. Tika, her art teacher was amazed, but unfortunately, it exploded in the kiln while being fired. It is so difficult to hold onto the artwork we treasure throughout our lives. I have Casey’s self-portrait in plaster on the water feature and Jordan’s Buddha on the fireplace. There are numerous two and three-dimensional art pieces throughout my home. Jordan was so proud of his three little turtles that are on display in the bathroom. What will happen to all of this when I am no longer in this body? I can’t say that I won’t be here, because I believe that I will, just vibrating at a different frequency. There will be no grave, no mausoleum. But my children know that they can speak to me anytime and they can always meet me by the river. I recently shared with my dear friend Alice, who is on a similar Journey as me, that with this illness I believe we are being brought into greater balance. The personal journeying she has shared with me recently has affirmed this Knowing. I wanted to share some of my deep, personal balancing. I have been particularly touched by a couple I have known for some time, who has been journeying through MS together. One has the illness, but they are together in their commitment of seeing this curriculum through. After David left, I communicated with Stephen to ask what enables him to stay. His response was so profound and personal that I will not share it on a blog; suffice it to say that he expressed reverence and deep love in his serving. Hearing his perspective gave me so much hope for humankind and appreciation for these friends whose lives are unexplainably interconnected with mine. From time to time, we check in with each other to share strategies and mutual respect. As I near the end of my ten week commitment to The Presence Process* with this week’s theme being, I FORGIVE MYSELF, what keeps coming up is that I need to forgive myself for having this illness. Everything else has been forgiven, but this last piece seems intransigent. During our most recent communication, I must have shared my pain and disappointment about traversing this journey alone in contrast to their shared path. There have been so many similarities and synchronicities along our respective paths, it is surely not a coincidence. But for me, David left. Stephen expressed something remarkable to me. “… dearest Aliyah, I have fallen for you in a way I cannot explain. Somehow there is a sisterhood of like souls on similar voyages and somehow the two of you have me on the same liferaft. You make it easier for me to care for [my wife]. I feel that I could be with you in your situation with perfect ease…” That last line was the clincher. I could not stop sobbing. He had struck a nerve. Pun intended. I was able to see the part of me that is so balled up and black that I cannot possibly be lovable. After all, David adored me and he could not leave fast enough. As I sat with the pain in my being, and allowed myself to soften and expand around this pain, I realized that it was myself that I could not forgive. Somehow, this invitation allowed me to see the deepest judgment I held was for myself: I had been so cruel to my mother when she was sick for ten years of my young life. My mother has long since forgiven me, but I had not forgiven me! My healing with this illness has involved revisiting the primary relationship with my mother, as I have described in much detail in previous blogs. It has taken Stephen’s kindness and devotion for me to access that place that we can perhaps call the missing piece. I also understand why I could never maintain a primary relationship and simultaneously do my deepest healing. I would fetishize and romanticize the love from others to protect myself from touching into this blackness. I had to hear love from another person, but also someone from the same liferaft. It is a wondrous process to unlock the depths of where we cannot love ourselves. It is by entering our deepest wounds where illness can sometimes be just the medicine we need for bringing us into greater balance.